Are you sitting comfortably? Then I will begin; this is a true story of how a 14-year-old discovered the band that is Uriah Heep. It was December 1971 and by then I was ‘into’ music in a big way: I’d discovered Deep Purple the previous year and, when a dear friend offered to take this callow youth to London for a day trip, my first thought wasn’t about the big city, it was about how I could get a pair of platform boots like Ian Gillan long before the fashion reached my North Eastern homeland. Came the big day and we set off on the train (in second class) and duly arrived in Paddington, caught the underground to Piccadilly and I emerged above ground like a butterfly emerging from its chrysalis. As my eyes roved the packed streets, the wonders of architecture passed me by as my eyes could only see Tower Records…I didn’t think record shops could be that big, after all at home I had to use Rumbelows and get past the TV rental area (yes, many could only afford to rent TVs at that time) before the wooden stairs took me to their limited record department. Here in London, there were LPs on a totally different scale. So my friend went of to do his shopping while I immersed myself in the vinyl. One record almost leapt out of the racks…I spotted a, literally, mirrored finish on this particular cover and then to discover it was fiendishly named “Look At Yourself’ because I was, I just had to buy it. I hadn’t heard of Uriah Heep at that time but, after I got home and read every word on the sleeve and the insert and then listened to it, I was hooked…and have been ever since. That is the power of the 12” vinyl sleeve. (I did get my platform boots by the way, and managed to buy a pair of purple split-knee loon pants with a 36-inch flair too! I was the height of fashion for about two weeks and have never been fashionable since). Of course, Heep had two albums before that, which I bought as soon as I could save the pocket money, and have released (not counting umpteen compilations) 22 since and, yes I do own every one of them, as well as most of the live and compilations. I am dedicated enough that in 2001, long before pledging became commonplace, I paid in advance to help the band create their ‘Acoustically Driven’ concert recording…and here is the evidence. I am not one of the Heep fans that go on constantly about the Byron era being the best: all of the many and varied vocalists/keyboard/drummers/bassists have brought a different patina to the band’s sound and Bernie Shaw, for example, has been a member for so long now it is a discourtesy to suggest otherwise. Their latest offering is called Living The Dream and as sole remaining founder member Mick Box reveals, “We have been together for 47 years and we have seen many bands come and go, so in effect, we are still ‘Living The Dream,’ so it was the perfect title for the new album.” The sound they make is also an ingenious mix of what I call the Hensley era and the Shaw era (and that is not ignoring the other members, past and present)…in other words, modern heavy rock with constant nods to the 70s; a strong addition to their canon and a recording of depth and class that puts many modern proponents to shame. The opening track, Grazed By Heaven, is bassist Dave Rimmer’s composition with Jeff Scott Soto providing the lyrics. It has a great guitar/keys riff and Bernie’s vocals are as good as I’ve heard. A really strong piece of rock and a trademark Box solo with a bit of wah, and an excellent Hammond solo from Lanzon…what’s not to love? 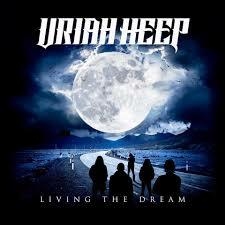 Title track, Living The Dream, opens with harmonised vocals before a riff reminiscent in atmosphere and structure to Perfect Strangers but 100% Heep widens the scope and then, mid-way through, a subtle rolling drum pattern heralds a classic guitar solo, and a keyboard solo to wrap it all up in a true rock package. Take Away My Soul is next and the guitar riff and drumming immediately drags you into a song that could well have been on Sweet Freedom, except it is Bernie burning the lyrics. The bridge is awash with harmonies and leads in perfectly to a Lanzon solo of quality and Mick takes us to the fade in a similar way. The bass on this track is worth listening for too, as Dave is playing a blinder as he and Russell drive the band along. Knocking At My Door starts a bit UFO, but quickly reverts to Heep. It has a complexity that, on first listen is off-putting, but it soon becomes clear that this is down to some sophisticated proggy sensibilities, and it quickly becomes apparent that it does work really well. Rocks In The Road is up next and, if Bernie wasn’t singing, you’d be forgiven for thinking that you were listening to Now What?! It is a superb song and the Box/Lanzon vanguard is the rock on which this was built. The bridge leads to a highly entertaining bass line with staccato chords from Mick as the keys swell and, as the pace picks up, the guitar takes us to the fade brilliantly… I love this track! Waters Flowing has more na, na, nas than any other on the album and is, therefore, the Heep of Magicians Birthday times but brought up to date with cleverly amped acoustic and the Heep ‘choir’ lifting the chorus. The inclusion of subtle piano, whilst not that apparent, is massively effective. The slower tempo suits the words and the backing is equally empathetic. Keys open It’s All Been Said in a sedate way before the riff really kicks in with a brilliant interplay in the stop/start sections. The riff eases off for quiet backing as the vocals rail against the state of the modern press, and return again to lead another quality Lanzon solo. Goodbye To Innocence has me wishing there was someone like this in my school when I was teenager…there wasn’t! It’s fast-paced rocker that’s over before you know it and, is a little like Easy Livin’ because of it. The lyrics are by Bernie as the ones he was given didn’t fit in his mind…what that says about him I hesitate to comment! Falling Under Your Spell is another faster rock-based song but with some trademark, harmonies to keep us Heep-ites totally happy. Dreams Of Yesteryear is the least Heepy and nearly falls into the AOR trap, but the band manage to imbue an original edge with the vocals and for such a melancholy song it works rather well in the end. A studied solo from Mick also lifts it above the AOR morass. Next is the inevitable (these days anyway) alternative version bonus track, so we get another run through Take Away My Soul which shaves off a couple of minutes and, frankly, adds nothing; but with quality like this, I can forgive them. So, 49 years and 25 studio albums into an illustrious and oft unappreciated career, Uriah Heep have delivered in my opinion the best thing for possibly 20 of those years…it is that good. The whole band are sounding better than they have done for ages, and Living The Dream improves on their last two albums and the renaissance that they began. It is rock for today with due deference to the rock pool from which it was born. It is ten tracks of Heepy Heaven (not counting the alternative version) that will delight established aficionados and, if there is any justice in this world, will put them where they have always belonged, sharing the top step in the pantheon of classic rock.